This is the second part in a series about the experience of starting and running a diversity council. If you missed the first post, it can be found here. In the second post, I share the importance of creating structure and communication, the importance of achievable tasks, and what we achieved in one year. In the next post, I’ll share lessons learned along the way. Before starting our Diversity Council, Jessica and I focused on our structure and communication because our were a dispersed company. We needed a consistent structure and open communication so we could make strides, hold each other accountable and move Diversity initiatives forward through achievable goals. The council needed to be a well-oiled machine. We both managed large teams, so we adopted our 30-60-90 day goals check-ins for the council. We built out our week-by-week template of communication: call for agenda items, formal meeting agenda items, quarterly meetings and recording minutes, scheduling individual pillar group conversations, and finally, publishing our meeting minutes with the rest of the company. To achieve these goals, get external support, and help each other grow, we needed to vocalize them with each other and the rest of our company. As a learning institution, we realized that the best way for us to learn to be more inclusive is through transparency. We started a Slack channel called #Diversity_Council that was open not just for council constituents, but to every member of the company, part- or full-time. Along with our minutes on the internal blog, this helped us establish full transparency with each other and the whole company. Finally, we assigned pre-work to the new council members (who had been nominated or self-nominated, and had accepted a council role), to write about why they wanted to be a part of the council to share during the first meeting. We wanted to build a good habit of open communication. We wanted our council to make an impact starting from day one. In our first meeting, we highlighted the importance of respectful but hard conversations. We acknowledged that everyone committed to put in extra time for the council; everyone had their company roles to focus on as well. If we tried to completely change diversity and inclusion overnight, we’d be overwhelmed and unsuccessful. So we encouraged smaller manageable goals. Finally, we committed to save time for open dialogue outside of the meeting agenda items for each meeting. This was crucial step, and probably one of our most important in running a council, as it set the tone. Now that everyone was aligned on the “how”, we wanted to align on the “why”. In the same first meeting, every council member shared their pre-work (why they joined). As each person shared, we began to understand and see how unique our reasons for being committed to diversity are. It showed us that our collective definition of diversity was inclusive and, more importantly, intersectional. Collectively we defined diversity and inclusion in a way that included race, gender identity, and orientation, much like a lot of the industry. However, for our staff and students, we believed that definition included anyone who may have been discriminated against in tech, including those with accessibility needs and disability, those outside of the 20-30 year-old tech worker age group, and military personnel, to name a few. Together, we recognized and valued the overlap of these areas with each other. Together, we wrote our council’s definitions of diversity and inclusion, our mission, and our rules of engagement together. We met quarterly as a team, and monthly as needed for each task force (Staff, Students, Community, Scholarships, and Communication). In team quarterlies, we discussed procedures, website language usage, inclusive student events, ethics, and D&I onboarding for new staff. For example, one of our biggest goals included formal D&I curriculum for our corporate training and immersive students, a large undertaking. In monthly focused meetings, we focused on next steps for each goal. For example, reviewing language on our website to ensure it was inclusive. Using the 30-60-90 day goal forecasting helped us move ourselves forward as a company and as a school. Half way through the year, I transitioned from Director of Instruction, to Director of Academic Operations and Diversity. I focused on running our council and projects that needed more attention, like scholarships. As the year went on, we adapted our needs, grew some additional support from non-council team members, and stayed focused on our achievable goals and got a lot done. Looking back at our small steps, I’m pretty proud. Of course, we had a lot more we wanted to get to, but we left things better than when we started and we stayed honest with ourselves about what we were capable of. September 2016: Creation of the Diversity Council, with about 20 members representing all areas of the organization explore and finalize Mission, bylaws, and definitions. October 2016: Vice President, Joe Biden announces the Tech Opportunity Fund, in St. Louis, Missouri. The scholarship, founded by TIY and others, provides access to bootcamp education to underrepresented people of color and women who are low income. October 2016: Visit to White House for the #CS4All Summit, where Tech Opportunity Fund announced again. 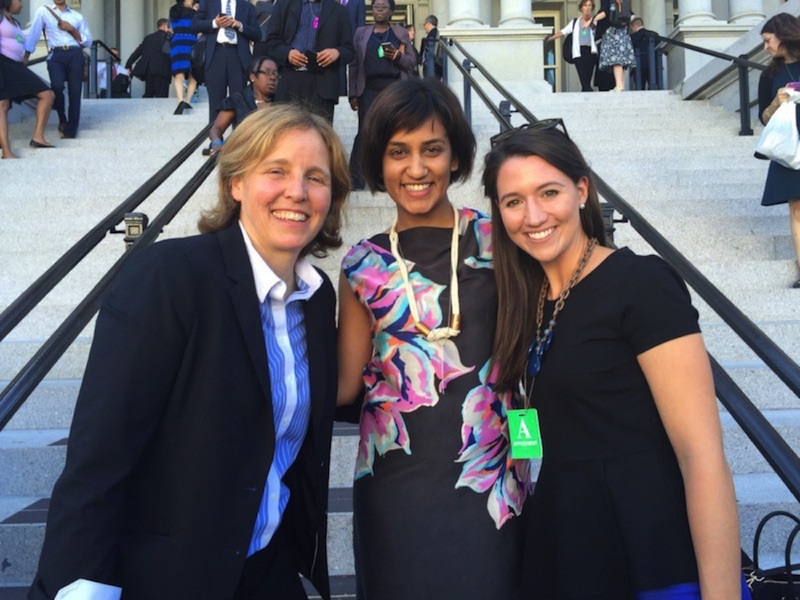 Megan Smith, former CTO for the United States (left), Jessica (right), and I at the #CS4All Summit at The White House, October 2016. October 2016: The White House invites student, Patrick, (and instructor, Tom) to share their #OpportunityProject, at an onsite, science fair style event. Patrick presented their project to Megan Smith, instructor was present, as well. October 2016: Staff Diversity Chair attends Google’s in-person Unconscious Bias training, leading to council training and review of company hiring policies. November 2016: Corporate Training staff work with students and American Sign Language (ASL) interpreters on policies for the classroom. December 2016: Event at DC campus where Meghan Smith, CTO for the US, announces 20 new TechHire cities. February — March 2017: All campuses host a licensed screenings of CODE: Debugging the Gender Gap, some followed by a panelists of speakers and with local partnerships including AllState, Women Who Code, Girl Develop It. February 2017: Indianapolis campus enrolls a 50/50 female-to-male ratio Front End Engineering class. March 2017: Requirements for 1k Diversity Scholarship reviewed, leading to removal of addition steps for applicants from discriminated groups. March 2017: The Tech Opportunity Fund re-launches as the #YesWeCode Fund. $100k raised in pledges at the SXSW announcement during HBCU and TechJobs tracks. HBCU track at SXSW 2017, announcing the #YesWeCode Fund. 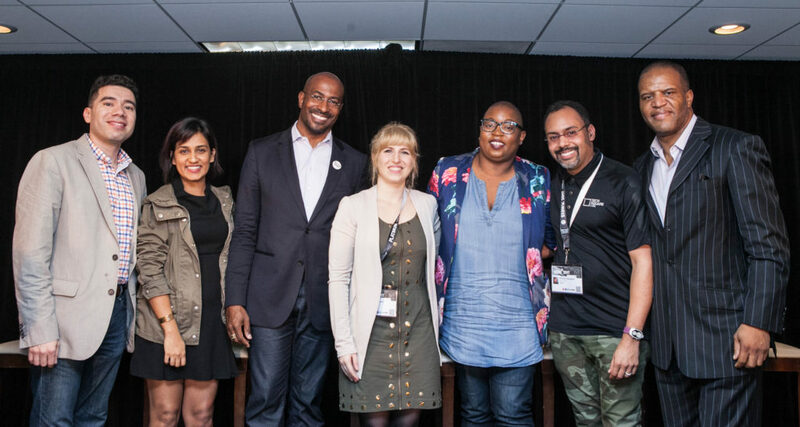 From left: Felix Flores, National Director for #YesWeCode; Sam Kapila, Director of Academic Operations & Diversity at TIY, Van Jones Founder of DreamCorps & #YesWeCode; Tess Posner, Managing Director of TechHire; Felecia Hatcher, White House 2014 Champion of Change, Co-Founder of CodeFeverMiami and Tech; Rodney Sampson, partner at TechSquare Labs; and John Hope Bryant, Founder, Chairman and CEO of Operation HOPE, March 2017, SXSW. April 2017: Attendance at HOPE Global Forum 2017, “Uplifting the Invisible Class”, to learn more about the socio-economic barriers our students below the poverty line could face. May 2017: Student Diversity Task Force co-chairs attend the Knowbility Conference in Austin, TX, bringing back resources, best practices, and actionable items for the council. May 2017: Our Director of Student Experience leads a task group which launches D&I Curriculum for Immersive Students with learning objectives throughout all 12 weeks. June 2017: Staff Diversity Task Force roll out new Classroom Diversity Training for Operational Staff. June 2017: Council and Product Team collaborate to add options to switch to a Dyslexia-friendly typeface, OpenDyslexic, on internally-built learning management system. June 2017: Student Co-chairs collaborate with Product team to create a deployment accessibility checklist for future code deployments. As a council and as a company, we were extremely committed to improving the state of diversity and inclusion. Hopefully, by sharing this, it can help you, the reader, take something our year, and bring change to your workplace and our industry. This isn’t easy work, but the much needed impact it can make is worth it. Stay tuned for the next post about lessons learned. For more D&I resources, stop by here, or watch my Creative Mornings talk.